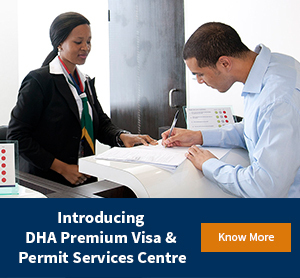 Department of Home Affairs is pleased to announce the opening of the Visa & Permit Facilitation Centres in 9 provinces and 11 cities within South Africa. Visa and Permit applications will be accepted across these 12 centres in South Africa. These applications will be assessed by Department of Home Affairs in Pretoria. Non-South Africans with a legal residency permit in South Africa can apply for a visa or permit at these centres. Attention Rustenburg Applicants: Please note that the Rustenburg office has relocated to Inner Arcade Shopping Centre , Shop no 2 c\o Fatima Bhayat and Boom Street. All applicants that wish to collect their decisions of applications that were submitted in the Rustenburg visa application center is kindly requested to visit the collections desk in the new office at Inner Arcade Shopping Centre , Shop no 2, c\o Fatima Bhayat and Boom Street. For any further assistance please contact the VFS helpline on 012 425 3000. VFS schedule for application submission and collection during 2017 Holiday Season Closures. Click here to read the complete information….